The race that finally clinched it was a bit messy, through no fault of his own, but the season in which Lewis Hamilton won his fourth world title has underlined his status as one of Formula 1's all-time greats. Hamilton's best is of a standard few have ever matched, and this year he produced his best perhaps more often than ever before. Now the holder of the all-time record for pole positions, he put together at least five qualifying laps to rank with the best he has ever done - Montreal, Baku, Silverstone, Monza and Malaysia were each breathtaking in the way they redefined the perception of what was possible. Of his nine wins so far, at least three were of the very highest calibre, and in very different ways - he fought back to catch and pass Vettel in Spain, held off a faster Ferrari in Belgium, and came through against the odds with pace his team did not know they had in wet-dry Singapore. And three others, in Britain, Italy and the USA, were utterly dominant. For much of the year, Hamilton was fighting a rival, Ferrari's Sebastian Vettel, whose car was probably better than his Mercedes as an overall package and certainly less temperamental. And yet he has won more than twice as many races as the German and nearly three times as many pole positions. Undoubtedly, Hamilton was helped by Ferrari's implosion over three races in Asia in September and October, when a driving error by Vettel and two engine problems effectively ended their challenge. But over the season Hamilton was calmer, more impressive, more consistent, more reliable and raced better. "He deserves it," a downcast Vettel said on Sunday evening in Mexico. "He had a very, very strong season. Two races to go he clinches the championship. In a straight fight, he was the better man. So, congratulations." Hamilton's season has been a triumph in ways beyond simply the pure racing. He has also set new standards for the sport statistically, and for himself as a professional. Hamilton already holds the all-time record for pole positions, broken at this year's Italian Grand Prix. At 72 and counting, who knows where he might leave that by the end of his career? In terms of titles, he is now in exalted company with only four other drivers in history - fellow quadruple champions Alain Prost and Sebastian Vettel, five-time winner Juan Manuel Fangio and record holder Michael Schumacher, who has seven. At just 32 and in the best team, that all-time mark looks reachable now. Schumacher's win record of 91 grands prix appeared insurmountable for a time, but even that is now looking vulnerable to a man who already has 62, and who has won 40 in the last four years. Hamilton's fourth title makes him unquestionably the greatest British racing driver ever in statistical terms, even if strictly speaking he was already that, given he was equal with Sir Jackie Stewart on three titles and had at least twice as many wins as anyone else. Hamilton says he carries the flag with pride, and that he is honoured to be in this position. But this achievement has a meaning that goes beyond patriotism. Stewart, Jim Clark, Stirling Moss; some of the men he has now surpassed in career numbers, and to whom he is being compared, are among those regarded to be the very greatest the sport has ever produced. Which says a lot about Hamilton. Statistics are not the only thing define greatness in an F1 driver; they are just part of the equation, something to be taken into account but considered alongside a whole raft of other factors. That is why some still regard the stylish and low-key Clark, a two-time champion in the 1960s with 25 wins from 72 grands prix, as the greatest of all time. For others it is Fangio - 24 wins from 51 races; five titles in seven years, all won over the age of 40. Or Ayrton Senna - three championships, 41 wins in 161 races and a legend as a global icon even before his death at 34. Or Schumacher. Or even Moss, who never won a title but bestrode the era between Fangio and Clark. The multiplicity of names, and the variety of careers, underlines the difficulty of the question of who is the greatest racing driver ever, and the elusiveness of an answer. But what is unarguable is that Hamilton should be regarded among that exalted company, that his quality shines above and beyond the numbers, and that he possesses all the attributes that define greatness. Over one lap, in terms of sheer unadulterated speed, he is unsurpassed - perhaps ever. His race-craft is superb. His skills in the wet are sublime. His adaptability means he can perform in any car in any conditions. As a racing driver out on track, there are no apparent weaknesses. Of course Hamilton has flaws, like any other human being. In the past, his failing has been to be "a bit up and down", as it was put recently by his former team-mate Nico Rosberg. In the past, the suspicion is that inconsistency was caused by psychological factors, which Rosberg ruthlessly exploited to hammer home the advantage that better reliability gave him in their final battle last year. This year, the variability in his form has had a different root - the behaviour of his car. The Mercedes has had a very specific weakness this year. Its technical causes are too complex to go into here, but fundamentally it was not competitive on circuits that required maximum downforce and had a low-grip track surface. 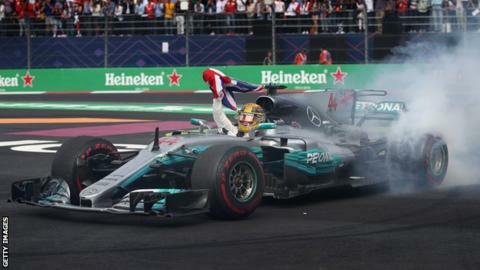 For the first half of the season, Hamilton struggled on these types of circuits, and was out-qualified and out-scored by new team-mate Valtteri Bottas in Russia, Monaco, Austria and Hungary. This was down to a refusal to accept the limits of the car, an attempt to force it to do more than it was capable of. The result was he over-drove and made mistakes. That's why for much of the year, Hamilton was playing catch-up, Vettel and Ferrari a more consistent combination and one that appeared it would be difficult to beat. At the summer break, after 11 races, the two were tied on four wins each, Vettel leading by 13 points. Since then, Hamilton has won five races; Vettel none. The secret was in the work Hamilton did behind the scenes, with the closeness of his relationship with his team, with his maturity, his focus and dedication at understanding how to get the best out of a difficult car. And his calm head out on track. He worked hard with his engineers at finding a way to minimise this weakness as much as possible and his second half of the season has been incredibly impressive. He won the races he was expected to and where Mercedes were strong - Belgium, Italy, Japan and the USA. But more importantly he excelled where they were not. His qualifying performance at Malaysia, that put him on pole at a race where the Mercedes was the third fastest car, was arguably the lap of the season - along with the one at Monza in the wet, when he was more than a second clear of anyone else. He was helped by the three-car pile-up that took out both Ferraris and Max Verstappen's Red Bull in Singapore. But no-one expected that once that gifted him the lead, he would out-pace Red Bull's Daniel Ricciardo behind him. Even the Mercedes engineers were flummoxed by where that came from. Where does he go now? After the race, Hamilton spoke eloquently and expansively, sometimes almost free-associating, about his achievement, what it meant to him, and the future. "It is crazy to think I have matched some of these records," he said. "They have crept up on me. But there are potentially many more years to go." And then he addressed the lifestyle that some people seem to find makes a fundamentally well-meaning, concerned, honest, open and generous person hard to like. "I do look at my life," he said. "I travel so much. It is a lot of sacrifice. To stand out in the world today, it is a lot harder because it has all been done before - to do something different as an F1 driver, not only be as great as you can be as a driver but also to do other things, to prepare your after-life to be just as great. "F1 is the pinnacle of the sport but it doesn't mean you can't still do great things. Doing something different that helps you stand out that highlights your individuality is really important and that is something I am working on. "I will continue to race while I love it, but I do think that it would be really nice at some stage to live in one place for a period of time. But then I think there is a lot of life to live beyond 40, and I can't come back to F1. "There will be point when I have had enough. I have been very blessed. And I want to go out on top. That is my goal. There is more to come. Hard times ahead, more challenge, and I love that." The race that decided the title began with a collision between the two men who have disputed it. And shortly afterwards Hamilton asked his team if he felt Vettel had done it deliberately. Afterwards, though, Hamilton was full of praise for Vettel, saying he was "as tough as they come" as a rival, that he had done "an exceptional job this year". That crash, and subsequent puncture, meant a drive through the field for both men. And it was fitting in its way that Hamilton's last tussle, over ninth place, was with McLaren's Fernando Alonso, with whom he fought a cataclysmic battle in his first season in F1 10 years ago. Earlier in the weekend, Hamilton was discussing potential future team-mates, and the challenge they might present, and he said: "I already feel like I've raced against the best here, which in my personal opinion is Fernando." That same day, Alonso was asked whether he regarded Hamilton as one of the five greatest drivers in history. "Yes," the Spaniard replied. "In F1, every single season he has been very competitive, apart from one or two with Jenson (Button) when he had some issues. He was able to win with a dominant car, with a good car like 2010 or 2012, or with bad cars like 2009 and 2011. "Not all the champions can say that."